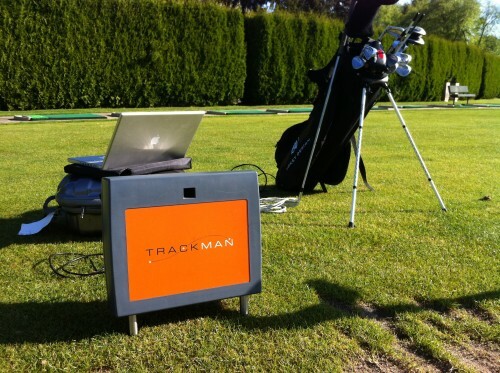 It has occurred to me recently that I have not written about my TrackMan use lately and I wanted to explain a bit about how I have been using it and the future plans for this wonderful data collection device. For the past couple of months every day that I wanted to get the unit out it seemed to start raining just before setting up, but the next ten days here look clear and after that we are approaching the Portland summer which is an amazing time of year and perfect for bringing out a ball flight monitor and laptop. Since January, when I wanted to use the TrackMan I went down to Trails End driving range and hit off the mats as the range is covered from the elements. Now, though, I can start collecting data based on hitting off of grass, which is ideal for really understanding your impact zone and ball flight numbers. Over the past month I have been collecting data with the PW, 5-iron and driver to send to Dr. K Anders Ericsson in order to better understand the current state of my swing, which we are deeming as the “base level.” What they surmise from this base level will help determine what aspects of the swing that I need to focus on in the immediate future as well as down the road. Anders and his associates are not experts on the golf swing and are not offering swing advice, rather he and his associate Len are exploring the data looking for consistency issues in the swing. For example, if they see that my PW has an average variance of 25 feet from the designated target and the PGA Tour average variance with that stick is 8 feet we look at the club variables to see if there is one blaring aspect causing this variability and then I can break down that number with my coach to figure out what I need to change in order to create a more consistent swing. The goal of this will be to shore up the inconsistencies and get my swing into an appropriate, or PGA Tour level, groove where my average distance from target with each club is at the appropriate level. I collect data both randomly and in a blocked format. On day one I hit 10 PW, 10 5-iron and 10 drivers all in a row and save that spread sheet. Day two I hit 10 of each club but run through them in a random order. I have been switching these styles of days to gather more information for them to analyze and am not sure what will come out of it, but will definitely post any results that they find. The idea is to change up my routine so as to not turn into too much of a range robot. Because of the wonderful amount of data that TrackMan collects we can analyze a huge number of different parts of my swing to figure out what is causing the flaws. If you look at the data sheets like this one from a couple weeks ago: http://thedanplan.com/blog/wp-content/uploads/2013/04/Dan-Plan-2013-04-21-Multi-Group-Report.pdf you can see how it would be possible to break the numbers down into countless subgroups to better understand what is going on with the golf swing. It’s possible to paint a brilliant picture of someone’s swing without filming it at all, rather through understanding how it is impacting the ball. Another fun aspect of gathering data is that once my new clubs are here and broken in we can see how the numbers change from the data that I am collecting right now. It will be absolutely fascinating to see if/how the Titleists differ from the Nikes. TrackMan is a powerful piece of equipment and the more I use it the more I realize that I have just begun to scratch the surface of how it is going to play a huge part in making me the best golfer that I can possibly be. If you have never used one, I would encourage you to find one in your area and give it a test run. I will be posting new data soon and once Dr. Ericsson and Len have had time to break down my base line swing I will definitely post their findings. Together we are going to help shed some light on what can literally help improve my game and, in turn, help any golfer who wants to break through to the next level. That is the goal and that is what I hope comes from these sessions. 22 Responses to "TrackMan back in full force"
Trackman is just awesome. Such an amazing tool. you are lucky to have one. Glad to see you’re making good use of it. I look forward to reviewing the data. I am wondering how you are using all this data to improve your swing, did you change anything so far based on these numbers? If you change your swing based off the numbers off trackman…I think I’ll have to join William’s camp haha. But seriously. Where you are in relation to the ball determines your contact and where the ball goes..the swing is just a way to energize the club. It’s the same every time. Dan I am a casual, yet faithful observer of your blog. I watched an interview with Lee Trevino the other day. 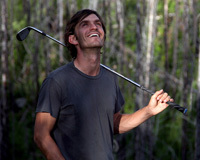 He said he got good at golf by playing and practicing. He said he got great at golf by playing for all the money he had to his name. I know it is a different era, but I look at all the “stuff” you have going on, trackman, new clubs, lessons, stat analysis etc. All of that feels like superfluous distractions that may never come together. If they don’t you have a million reasons why you didn’t achieve your goals. It looks like you are fundamentally sound enough. Fundamentals don’t winat a high level. the ability to compete under pressure wins. You can only gain confidence by executing in that circumstance. you can’t do that by looking at data. Reading the TM report i have to assume that you wanted to hit the same shot all the time. If that assumption is correct then please take a look at the clubhead speeds. Iron 5: swing speed is between 89.9mph and 85mph. So even if you would each shot exactly the same the carry difference would around 8-yards just because of that swing speed difference. PW : between 80.1mph and 72.4mph ! I concur. I’m no expert in golf, but it seems to me that you started the first year of your journey by practicing very specific shots over and over (deliberate practice). 1 foot putts, moving slowly to 2 foot putts, etc. And now you’re into using computers to analyze your swing and playing full rounds of golf every day. Has the nature of the sport changed since then? Seems like you’re caught in gadget-itus that many golfers also get into. There’s always going to be one more high-tech golf gadget. Is it really helping you or just distracting you? I realize high tech gadgets and full rounds of golf are more fun, and its your journey, but I did Tiger Woods use the TrackMan before he made the tour? Or did he just use deliberate practice? I think that experimenting with different tools is healthy. Dan will go through periods where he tries TrackMan, and if he doesn’t get the payoff out of it, then he’ll find something else. You can criticize the tools, but his effort has been consistent. The effort is what really matters. Hey Dan, why don’t you play from the mat like everyone else? I notice you took a lesson from a different professional recently (B. Furman) rather than your regular instructor (A. Burtner). Have you changed instructors? Do you think getting instruction from two people is a sound approach? Effort does not matter much at all. Working on what matters is the thing that achieves results. Actually both matter and I would say in approximately the same ratios. The great thing about the Trackman is that it will be able to tell Dan exactly what he needs to work on. Maybe is angle of attack is too steep, maybe his club face is open to the path, etc. He will know that immediately and hopefully his instructor will create a plan for him to work on those things in a deliberate practice method. With all that being said the majority of tour players are using all of these things to help them, why shouldn’t Dan? Based on my observations, from a plain statistic point of view, I would focus more on reducing the spread (the side) and become more consistent in direction. Not sure if that relates to swing speed, angle of attack etc. Just an observation per say and would assume this would also improve FIR and GIR. if und would macht satz kaputt!